Are you a fan of Vladdy?... Or Baseball?... Or Chicken Wings? Then again… who doesn't love all three!? Right now on Bisons.com, we're holding a special one-of-a-kind auction for those that love any (or all) of these amazing things! The Bisons have put three Game-Worn Buffalo Wings Jerseys up for auction! And if you thought that was hot, check out the players whose jerseys we are featuring: Vladimir Guerrero Jr. , Danny Jansen and Sean Reid-Foley !!! 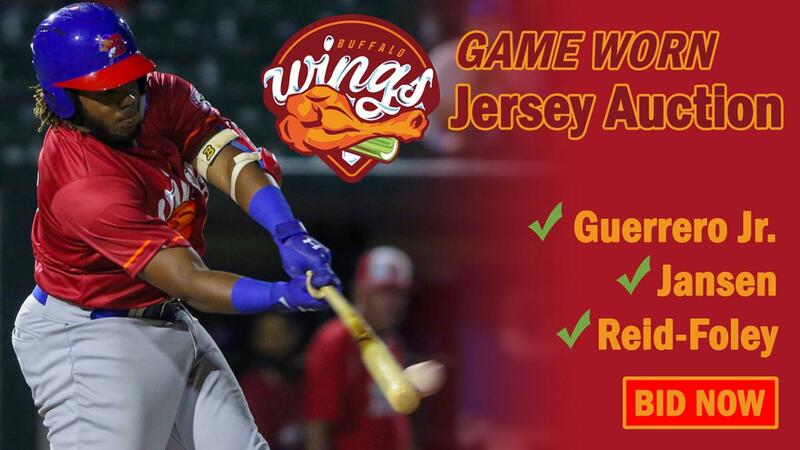 These are the Wings jerseys the players wore this season in games against the Rochester Plates/Wings. The auction will run through 9:00 p.m. ET on Friday, December 7, or sooner if someone chooses the special 'Buy-It Now' price that's available on each jersey. And not only does this auction net you a one-of-a-kind piece of Buffalo sports memorabilia, proceeds also benefit a great cause in the Buffalo Bisons Charitable Foundation. Remember, these auctions end Friday night, so get those bids in now! !